Rescue Labrador Barney is Quantock Vets’ Pet of the Month! 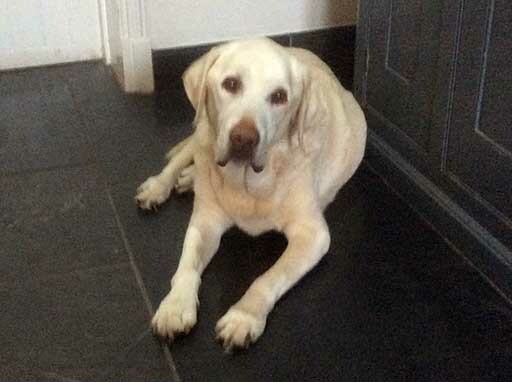 Barney, is an adorable yellow Labrador who is cherished by his owners and everyone at Quantock Vets! At nearly fourteen year’s old Barney has been a long-time client of the hospital. Like many Labradors, over the years he has suffered from joint problems. In 2009 he had had cruciate surgery and in 2013 he started medication (long-term anti-inflammatories and supplements) for bilateral stifle stiffness. In 2014 he also started suffering from some forelimb lameness. Mrs Dilloway explained “Barney is a dear, dear dog – we’d do anything for him. We originally got him from ‘Bath Cats and Dogs Home’. 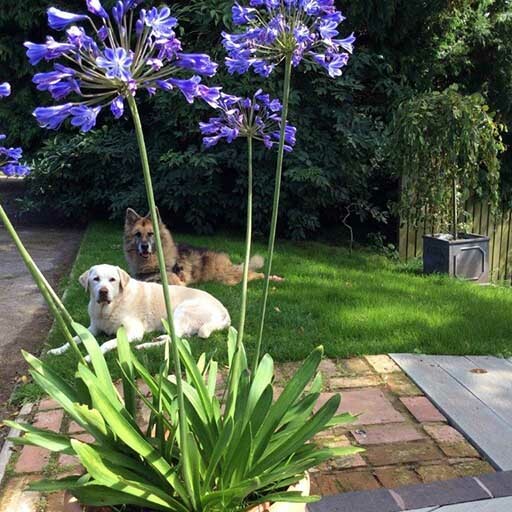 We re-homed him with an Alsatian called Tye as the home were keen to keep them together. They were inseparable (see photo) and when Tye went downhill with his epilepsy and losing function in both back legs, Barney became Tye’s attentive carer, never leaving his side and always getting my attention if Tye was about to have a fit. Tye actually ended up having a set of ‘Walking Wheels’ which were magical and meant he could carry on as he used to! But back to Barney! Barney is well known at Quantock Vets having had heart problems as well as stiffness. Over the years we have tried different medication options for his aches and pains but it was getting worse and we were very concerned how it was affecting his quality of life.”. In the spring of 2016 the Hospital invested in new laser treatment and it was trialled on Barney, in addition to his other medication, to see if it had a beneficial effect. Laser therapy was carried out on his elbow, stifle, carpus, elbow and stifle. Sessions are non-invasive, painless and took around one hour each time on Barney due to the number of sites being treated. Initially Barney – who tolerated the treatment well – had a course of six treatments over two weeks. Barney is certainly a special character and very popular at the Hospital. He’s proved to be a star at home not only looking out for Tye whilst he was alive but also helping care for some kittens whose stray mother wasn’t interested! Mrs Dilloway took on Gina, a little stray, only to find she was pregnant and promptly produced a litter of kittens and then “didn’t want to know”! Mrs Dilloway would frequently find the little kittens all cuddled up in Barney’s dog bed with him standing guard! Congratulations Barney – Pet of the Month!